The Chalice Choir has been working for months on an especially challenging and ambitious piece. 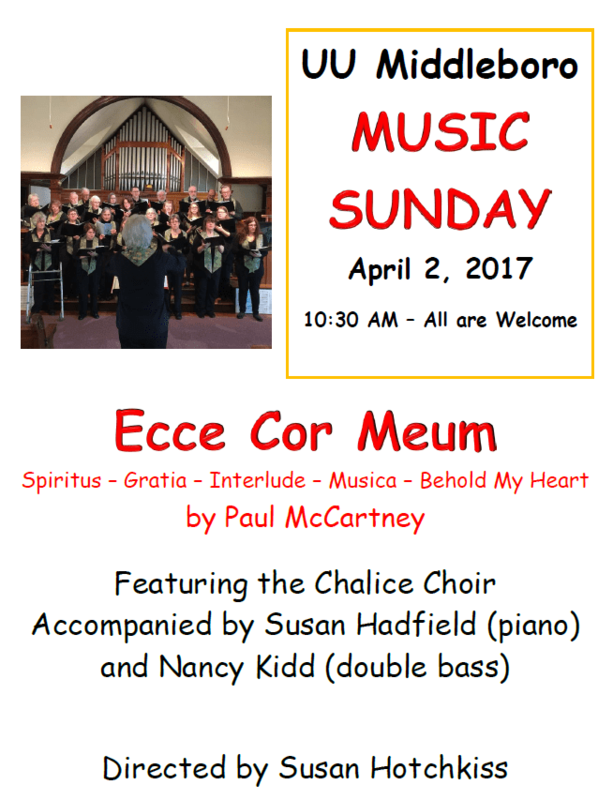 Paul McCartney’s choral suite “Ecce Cor Meum” (Behold My Heart) will be the centerpiece of Music Sunday at the First UU Society of Middleborough, 25 South Main Street, on April 2 at 10:30. McCartney’s five short movements set enchanting melodies reminiscent of the Beatles era to complex classical-style choral harmonies. The 25-voice Chalice Choir, directed by Susan Hotchkiss, will be accompanied by Susan Hadfield on piano and Nancy Kidd on double bass. Patty Simon, flute, will perform additional selections from “Suite Antique for Flute and Piano” by another English composer, John Rutter. In addition to readings and congregational song, Ms. Hotchkiss will reflect on “chords and discords” of contemporary “classical” music.